The stillness of winter infuses MacGregor Point Provincial Park in the off-season. The doors are shuttered at the permit office and the visitor’s centre, the firewood cages are empty and untouched snow stretches as far as the eye can see. It’s a bit of an illusion though. The bustle of tourist season may be a distant memory but despite the frigid air there is still something exciting happening. 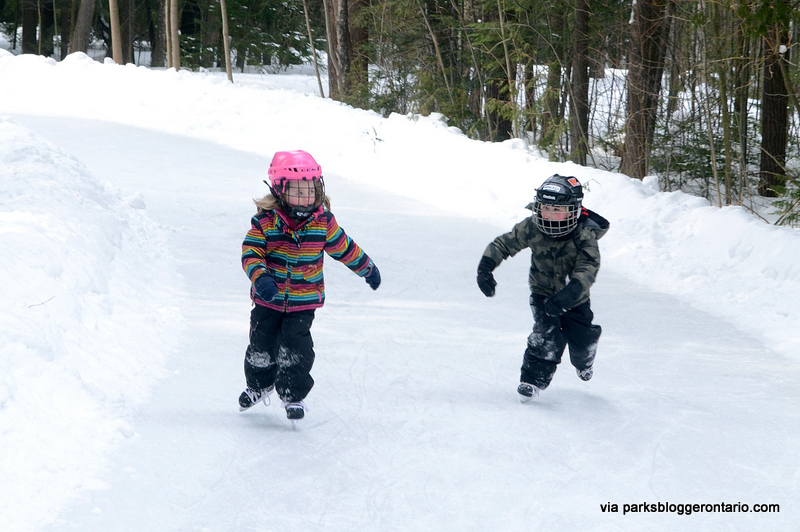 Each year, cold temperatures permitting, the park plays host to a unique feature, which draws in locals and day trippers: a 400-metre skating trail loop through the park’s forest. But that’s not all. 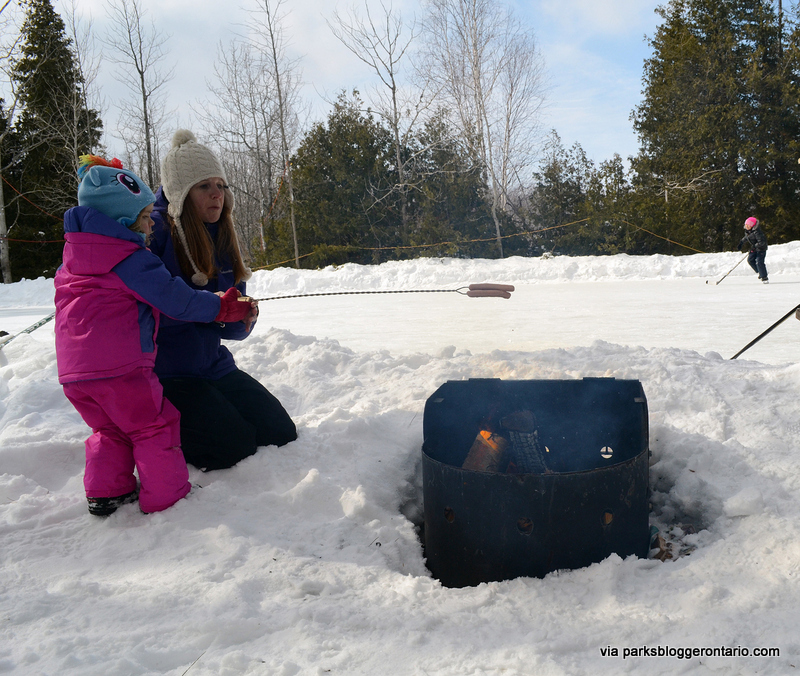 Bonfires are welcome, with campfire pits stationed at the skating loop and nearby at an adjacent hockey rink, as well as bird feeding station. 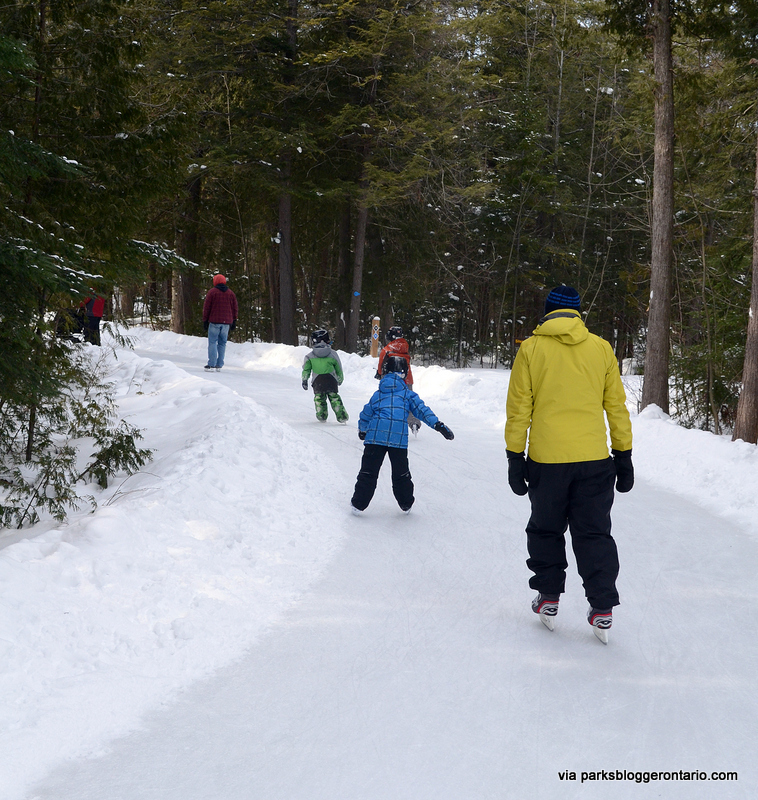 The winding trail is situated in the park’s Algonquin campground, next to the cross-country ski Deer Run Trail entrance. The loop is surprisingly smooth for an outdoor ice surface and though there is the ever present light crackling of ice under blade, there are no rough patches to catch skates and falls were few and far between. The elevation of the trail follows the natural slope of the area, racing skaters downwards for three quarters of the distance and then forcing a slight uphill climb for the remaining stretch. It’s an easy skate for even the smallest children and the loop always keeps a couple PVC skating aids on hands for novices. 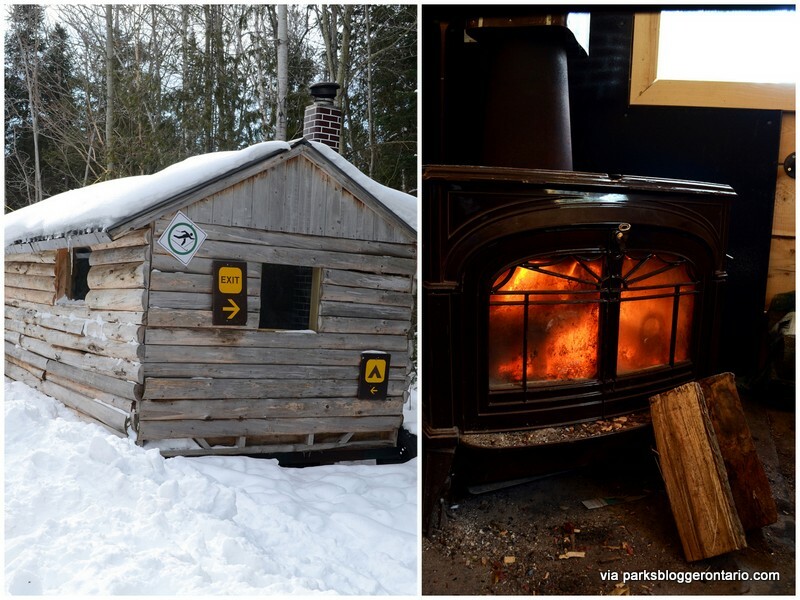 The best feature: a toasty warm-up log hut, which offers a comfortable spot to lace up skates and a respite for frozen fingers. A roaring fire glows behind a glass-door woodstove. The small town charm is palpable here, while strangers chat amicably as they take off their skates and wait for the circulation to return to their toes. 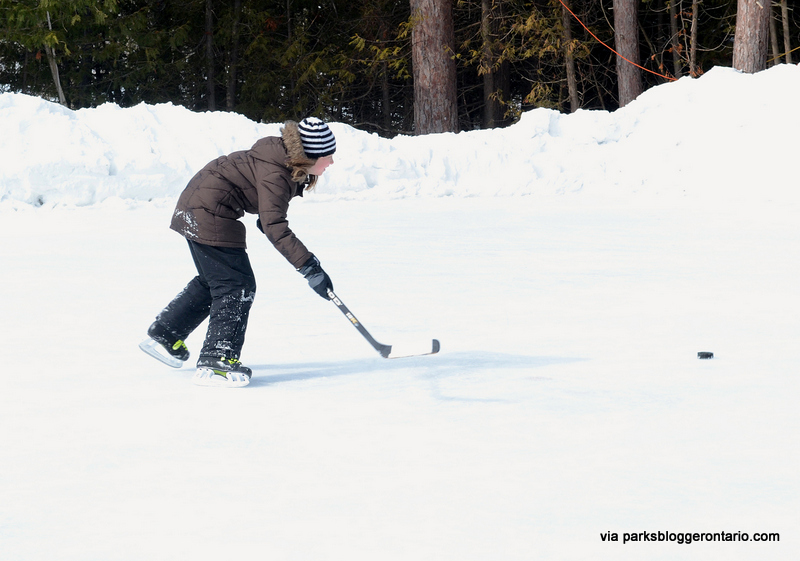 Beside the Visitor’s Centre is a spacious rink already set up for a good ole fashioned family game of pick-up hockey; nets provided. Picnic tables are set up alongside the rink, as are campfire pits. The wafting smell of a burning fire and camp food is a strange but friendly addition to MacGregor’s winter experience. Though the bonfire typically harkens thoughts of summer, it couldn’t be more fitting at an outdoor skating rink. Families break from the fun exercise to roast hotdogs and toast marshmallows, while outdoor picnicking at cleared tables. Firewood is available for purchase at the administration office. Remember, MacGregor is under threat from the Emerald ash borer. Transporting wood into the park from other regions puts the beautiful trees at greater risk from invasive species. 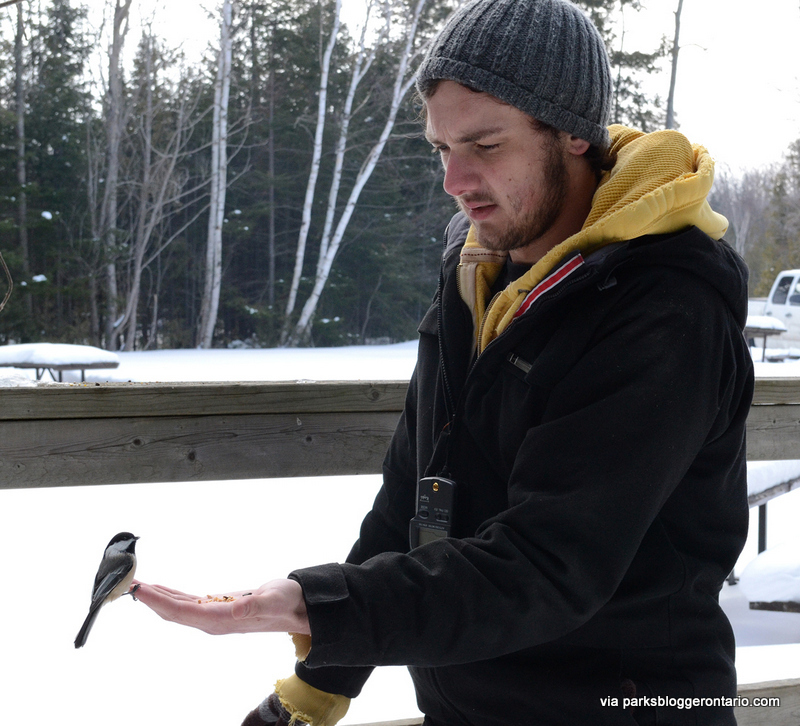 A short walk from both skating areas, park staff have set up a small bird watching station at the Huron Fringe Trail entrance beside the Visitor’s Centre. 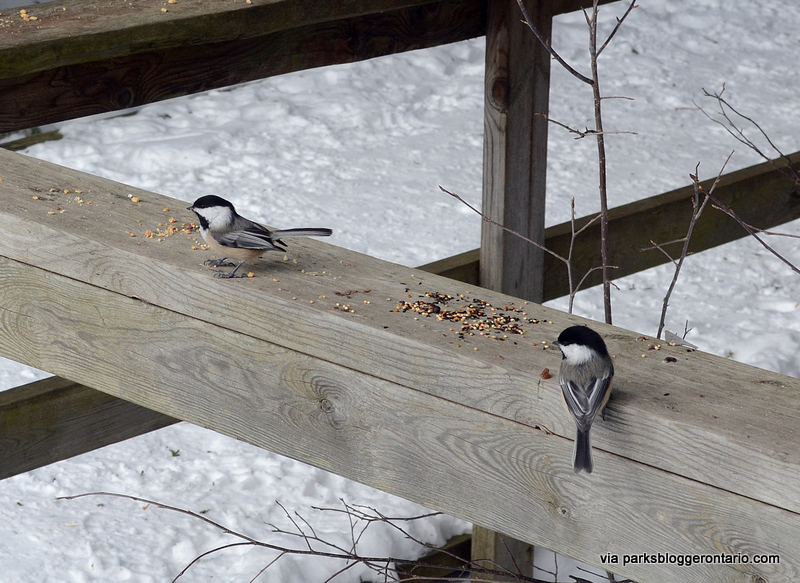 Bird feed is scattered about and chickadees, red squirrels and nuthatches flit to and fro as they munch on treats. Bring some sunflower seeds or crushed peanuts if you want to really entice the birdlife. With patience, silence and stillness you’ll become a perch for hungry birds. Do not forget your camera and for a memorable experience sprinkle some feed on the hats of your unsuspecting loved ones. Photography and story by Jennifer Schleich. Jenn is a freelance writer who calls the beach home and loves exploring Bruce County’s natural retreats.